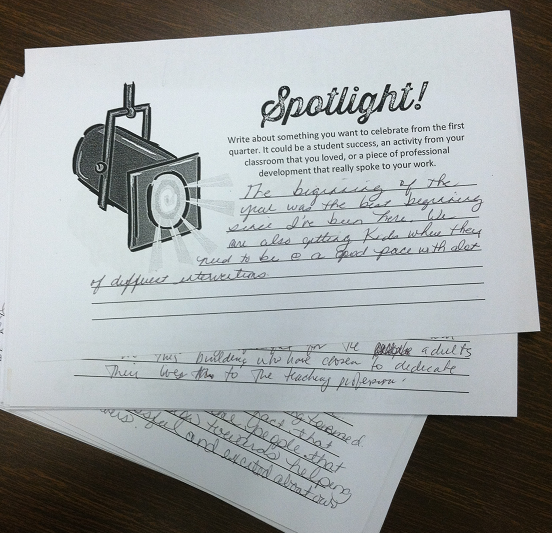 After the first quarter of School Year 2014-15, at a building inservice session, I commended my staff for a hugely successful first quarter and asked them to do a quick-write about what they could celebrate about the beginning of our school year. One of our new teachers wrote: "It's nice to work in a school where the staff is so friendly and helpful, and the administration is so supportive." A member of Team 6 (sixth-grade teachers) shared, "6th grade worked very hard and got all kids who needed a [behavior] plan on a plan." 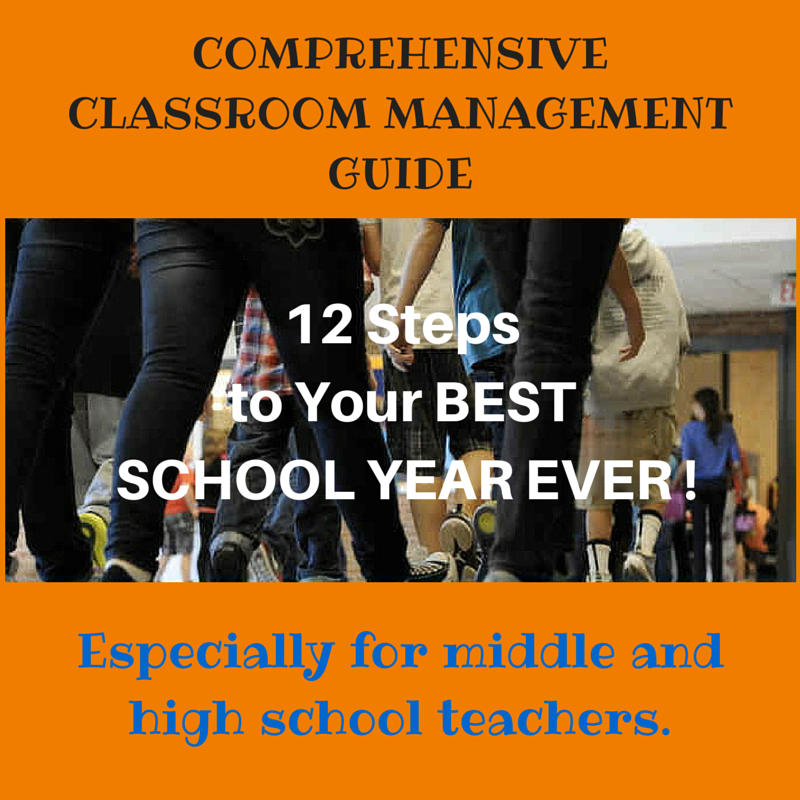 An anonymous teacher wrote, "The beginning of the year was the best beginning since I've been here. We are also getting kids where they need to be (with behavior plans) at a good pace, with a lot of different interventions." Another teacher echoed my sentiments about our Kick-off Rally: "Our first rally this year was one of the best ever!" 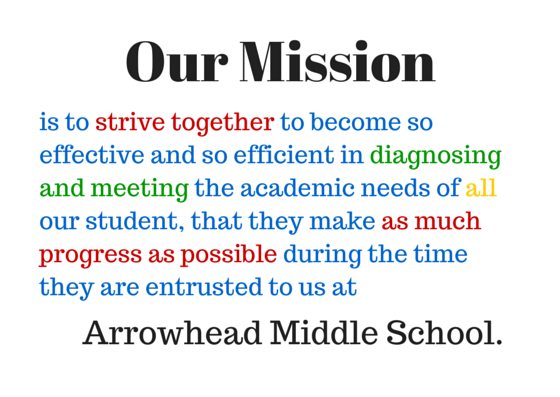 A Team 7 member wrote, "I want to celebrate the fact that seventh grade team is really trying to get our students what they need. It does not matter if it is behavior, grades, or a quick hug, we are all there for our seventh graders!" Even the teacher in our ED (Emotional Disorder) classroom celebrated her students' behavior: "This quarter I'm celebrating the fact that, despite the challenges, we are surviving and thriving. Our new students are learning new coping skills and undoing old habits." The lead teacher in our alternative program, School Within a School, celebrated that "all the students in SWAS (Safehouse) have stayed in school through first quarter. No student has been long-term suspended." A veteran high school teacher who transferred to our middle school wrote this list for her celebration: "#1 I don't hate middle school. #2 Some kids and I have come to an understanding, and they're trying and improving so much. #3 I love working as a team!" As I have expressed in the past, I love having you as a boss, and I sincerely appreciate the support you consistently provide to me and others when needed. My favorite things about you, as an administrator, include your commitment to keeping all kids in school - meeting them where they are, and moving forward from there - and your commitment to structure, routine, unity, relationships, and personal and professional growth in order to support all students' needs. I have always said that I love working in KCK, but I have realized it's not actually KCK, but it's that I love working at Arrowhead. I told my staff that I was really blessed by her sharing these sentiments with me because she actually articulated the vision I held for our school. Knowing that people were "getting" the vision and responding to it is more fulfilling to me as a building leader than almost any form of recognition or reward. You will notice that almost every celebration had to do with helping struggling students to manage behaviors that would keep them out of class or out of school, or with engaging students in the programs we use to increase a sense of belonging and provide orchestrated fun at our school. Teaching teams also provide specific interventions as soon as students show that they struggle with or resist doing school work. Because we have so many new staff members this year, and because it has been a few years since we revisited the basic components of our classroom discipline system with everyone, we focused quite a lot on training in and discussion about the first two levels of our Our Multi-Leveled School Discipline System during August inservice and first quarter. These levels are "Large Group Supervision" and "Classroom Discipline." All teachers attended grade--level sessions on how and why to implement the specific components of our system. All teachers taught and rehearsed school-wide and classroom procedures. All teachers taught and reinforced the behavior standard expressed through our Five Common Rules for every classroom. 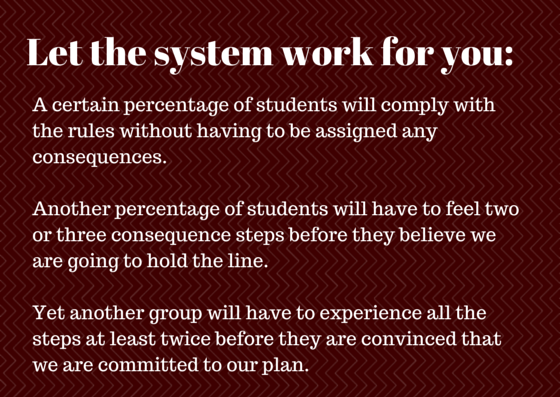 All teachers taught and implemented the Four-Step Consequences for rule infractions. Because we know that adults' expressions of exasperation or frustration undermines our efforts with kids, we encourage teachers to let the system work for them: Just take the actions we said we were going to take for each incident of misbehavior. By mid-September, at least 90% of our students were responding well to our system. Ten percent, however, needed additional support. Teachers use their team planning time (45 minutes each day) to identify and discuss kids who struggle with behavior and to construct support plans for them. 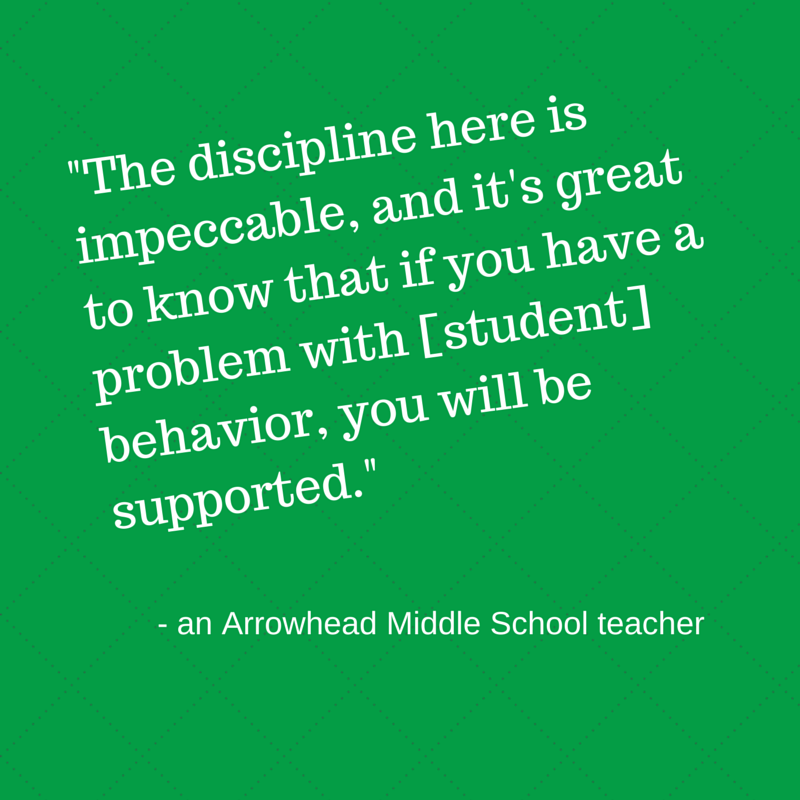 The behavior model we use to help these students is the Behavior Intervention Support Team (BIST) model, which refers to kids with repeating behavior issues as "chronic" students. This work, planning and implementing customized behavior support plans for kids who have not managed to be successful in school, is the work so many of us were celebrating by the end of October. Our teachers demonstrate extraordinary expertise in working with all kids, and especially students with very challenging behaviors and mindsets. At this writing, we have 19 sixth-graders, 20 seventh-grades, and 8 eighth-graders (of our population of nearly 500 kids) on behavior plans that are completely facilitated by their classroom teachers. These are students who, without our teachers' expertise, would surely experience repeating suspensions and eventual long-term suspensions or expulsion. I have never seen a group of educators implement behavior supports for students as effectively and with such commitment as my current staff. I celebrate them, and I celebrate their continual growth in this critical aspect of our profession.